When you are setting up your RetargetApp-powered campaign, at a certain point you will need to accept the invitation to manage all the assets RetargetApp created for you. How do I accept the invitation? Read the message on the screen and click on "Go to invitation" link. On the tab that opens, input your name. It has to be at least 2 words long. Review the settings and click "Verify with Facebook". Once it's done, return to the tab with RetargetApp and click "I accepted invitation". Note: You will also receive an e-mail with the invitation. 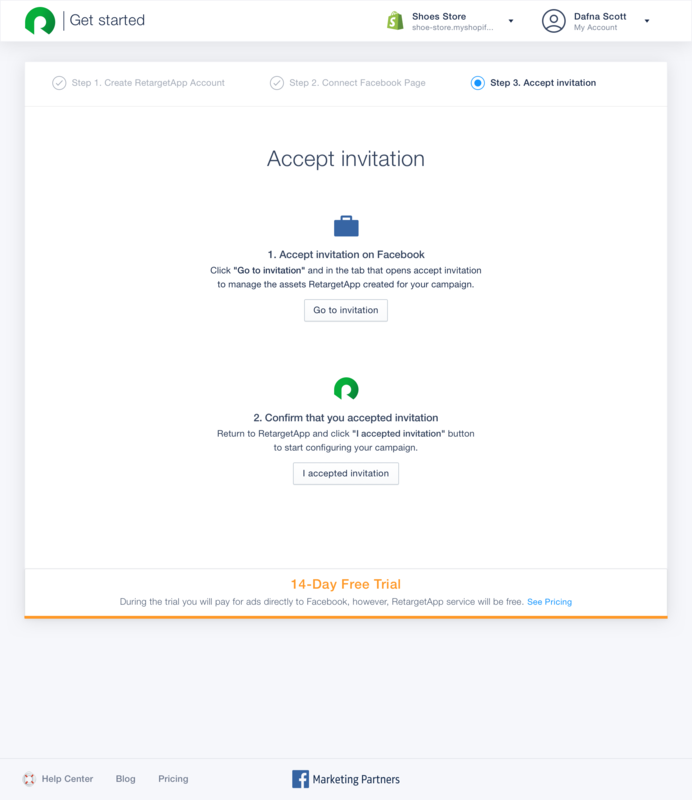 You can ignore it as the invitation can be accepted in the app interface. RetargetApp strives for transparency. When you launch a campaign with our app, we want to make sure that you are able to access your campaign data 24/7 - this is why we ask you to accept the invitation to manage the assets. If you feel that the data presented on RetargetApp is sufficient, you will not need to log into the RetargetApp-powered Business Manager in future - however, you should always have an opportunity to do so. Note: You cannot use your own Business Manager to run a RetargetApp-powered campaign, nor can you use the RetargetApp-powered Business Manager to run any campaigns of your own. I was launching the campaign, but I didn't see the invitation. What do I do? If you have already launched a campaign for one of your stores, it's okay - starting from the second store you launch the retargeting campaign for, you won't need to be invited to manage assets again.